Eliminates pet odors and bad breath. Reduces odor in kitty litter boxes. Promotes healthy, soft, shiny coat. 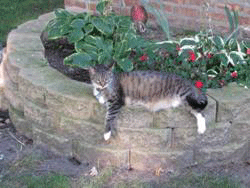 Lessens or eliminates lawn burn / brown spots in pet areas. 100 % all natural, odorless and tasteless product. Safe for pets of all ages – newborn to very old. Why was “The Pet Beverage” Developed? One of our company executives had a dog, named Ginger, which required kidney stone removal surgery. After spending $800 for the operation and $40 per month for antibiotics, he asked our research staff if there was something to help the dog’s digestive system. First, we evaluated some initial formulations for product safety. Then the product was developed from combining and adjusting several of the preliminary formulations. Needless to say, Ginger was the first “volunteer” for product consumption. We had numerous other “volunteers” over a 2-year period using the formulation now known as “The Pet Beverage”, with complete satisfaction of all the pet owners. The Pet Beverage was a success! The antibiotic treatments used to retard the kidney stone problem had been discontinued. She was a healthy, vibrant, active dog until old age got the best of her. We found out that The Pet Beverage did much more than help with Ginger’s digestive system. She smelled better, had better breath and a much shinier coat! In fact, our veterinarian commented during a March 2001 visit that, “Ginger had the shiniest coat of any dog she had ever seen of that breed”. It was hard for us to let Ginger go, but as of March 2008, we have a new addition to the BioWorld Family! We adopted a Shepherd mix puppy named Bella from a local shelter. Thankfully, we already had The Pet Beverage because that poor puppy really smelled! Not only did she smell really bad, but her coat also looked awful from being a stray and in the pound. They found Bella wondering in the country, apparently abandoned by her previous owners. She had fleas, ticks, rashes, worms, kennel cough and mites that infected her poor belly. She had pretty much everything but Parvo. 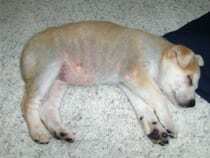 The mites on her belly made her skin dark and sensitive, so we were unable to give her a bath for 3 weeks. Anyone who has adopted a pet from a shelter should know how bad they smell! It took a long time for Bella to fully recover to a healthy puppy, but after about a month, you would never know what she went through. The best part is that she no longer smells! Her skin is returning to its normal color and her coat is beautiful. We get many compliments when we take her out about how shiny and pretty her coat is. A local PetSmart manager was the most recent to notice! She has been a great enjoyment for our family and she, like Ginger, comes to visit the office from time to time! 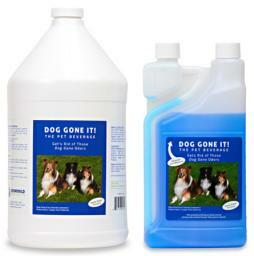 We hope Dog Gone It (The Pet Beverage) allows you to have a more enjoyable time with your pet. Please send us your stories and photos of pets using Dog Gone It and check out Reviews for more stories of how Dog Gone It (The Pet Beverage) has helped their pets! 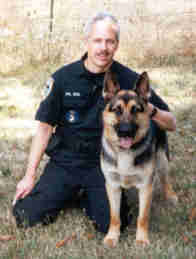 Cody is a 5-year-old German Shepard who is a trained narcotic detection K-9. K-9 Cody and I conduct prison searches, participate in narcotic search warrants and vehicle stops. We also do demonstrations for schools, social clubs and just a lot of day-to-day public contact. It is important that Cody looks and smells his best. I have tried a lot of products trying to keep Cody at his best, but haven’t had much luck. Cody has always been plagued with bad breath. For about a month I have been using “The Pet Beverage” and have noticed that his breath and coat have improved. People are constantly telling me how great his coat looks and feels. I notice that his breath is better because he rides around with me all day and is often “literally breathing down my neck”. I add “The Pet Beverage” to his food daily, it’s easy and Cody still gobbles his food down as fast as ever. No more brown spots on the lawn! I’ve probably told you this before, but this is just the greatest product. Since we began using it several years ago, we have never had yellow spots on our lawn. Thought you might like to see a picture of our three dogs (on the beautiful, unspotted lawn!!). The cats (9 of ’em!!) 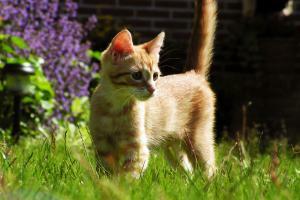 are indoor cats, but the product has sure helped reduce the odor in their urine. 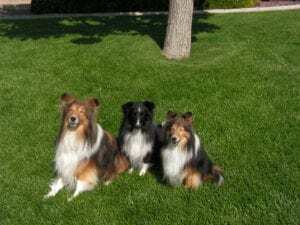 Tip from C K on how she used The Pet Beverage for mulitple pets: For the 4 cats, and the 3 indoor dogs (the Shelties) I use the 1-gal Le Bistro waterers you can get at Petco and Petsmart. I’ve been using Pet Bev for so long that I no longer bother to measure — just do it by sight (and count…as I’m pouring into the 1-gal container I count to 6), but I estimate it’s about 3/4 to 1 C per gallon of water. For Shayna (the Husky) I have a 5-gal Le Bistro for outside (also available for the Shelties when they are out during the day) but it’s the same relative proportion. Hope that helps. 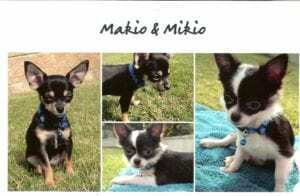 I have 2 Chihuahua puppies (5 month old short coat & 7 month old long coat). The older puppy had so many problems when we got him from a breeder. He had this terrible odor about him do to allergies, parasites, worms and he eats his own poop. After a week of “Pet Beverage” he was odor free! Can’t say that it helped with poop eating (but were using other methods to try to help him with that). After a few weeks I decided to withhold the “Pet Beverage” to see if it really worked. I lasted 2 days and started him up again. Thank you BioWorld for a wonderful product. Our other puppy has benefited from your product as well, he has never had any odor problems but his coat is just beautiful. I just put in an order for a gallon … I don’t want them to be without it. I was skeptical about ordering your Pet Beverage. However, I can honestly say, it was money well spent. 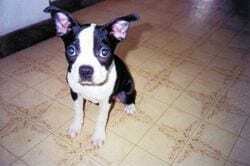 I can bathe my Boston Terrier one day and she has an odor the next day. I started her on Pet Beverage and within two days the odor was gone. After a couple of weeks I decided to try an experiment. I stopped giving her the Pet Beverage. Two days later she started to have the odor again. I restarted her on the Pet Beverage and the next day the odor was gone. Good on you for making such a fine product. 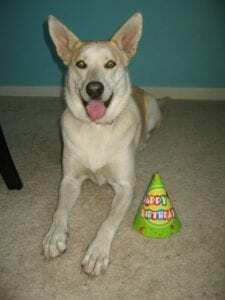 D. Potts – McKeesport, Pa.
We love The Pet Beverage! We have 5 Afghans so we needed a product that really worked so we decided to try The Pet Beverage. We started using The Pet Beverage and it solved out pet odor problem. If we run out of The Pet Beverage, we notice the odors return and our Afghans coats are not as shiny and they shed more hair. We are sold on The Pet Beverage! I have been treating my two mixed breed dogs with the BioWorld Pet Beverage on an on-going basis for very bad breath odor. The treatment has been very simple. I just add Pet Beverage to their water. The Pet Beverage has worked great! We can actually stand to be around our dogs. Their odor has decreased substantially in less than 1 month. It worked so well that I decided to try it in my fish aquarium. The results were astonishing! It took away the bad odor and provided crystal clear water. I highly recommend The Pet Beverage! Beagle, No More Gamy Odor! I am reordering 4 bottles of your Pet Beverage. Our Beagle Hound is known for his gamy odor. Several family members complained about the dog being in the house because of the odors. Since using The Pet Beverage product, we have noticed a major difference. Golden Retriever With Horrible Breath! I am very happy with The Pet Beverage. It is the only product I have found to take away the horrible breath odor of our Golden Retriever. Since it is the summer, here in Texas, our dog is drinking lots of water. I think she is getting between 1-2 ounces of The Pet Beverage each day. Thank you, and I will tell people about the product. It certainly works on our dog whose breath used to take the wallpaper off the wall! I found your website in Thirdage.com. My Pekingese has such bad breath it’s difficult to be around him. I added The Pet Beverage to his water and the next day I noticed the difference. NO BAD BREATH! What a miraculous product and I have sent the url to my friends who have pets. The dog and I thank you! I will be a repeat customer. 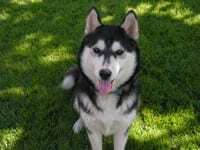 Our indoor dog, Nick, is a 9 year old, 26″ high and 125 lb. purebred German Shepard. Prior to using The Pet Beverage, he had bad breath that was comparable to a trombone blast of air containing a very foul smell. The Pet Beverage has worked so well with improving the quality of Nick’s breath that our friends can actually enjoy him now. Also, there seems to be fewer flies in the backyard. Winnifred, Midget & Buster – Noticeable difference in less than a week! Just wanted to let you know my dogs have been on The Pet Beverage less than a week, and there is a noticeable difference! Your Pet Beverage is wonderful. Thank you very much. Dog and Cats – Hair sooooo SOFT!!! It has been two weeks of using The Pet Beverage…..WOW, my dogs hair is soooooo SOFT!!! I noticed the shine of my cats coats, but they are not in a cuddling mood for me to really feel their hair, so when I do, I definitely will let you know. A veterinary doctor at one of the major universities in California is purchasing The Pet Beverage for his household animals. 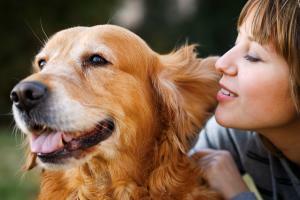 “The dogs do not have bad breath or body odors. I am very impressed with this product,” said the veterinary doctor. Pet Odor Problem Solved with The Pet Beverage! The Pet Beverage is working very well to solve my pet odor problems! I need to place another order! A Much Happier Pet Owner! I have to tell you that this is a miracle product. My 2 Jack Russell Terriers love to wake up and give me huge kisses in the morning and their breath would knock me out! Since I started your Pet Beverage, the change is incredible. They actually have sweet breath and it is so much more pleasant to be around them. Also, my male which was neutered later in life, has a marking problem in the house. I used to smell strong urine odors but now I smell nothing!!! It has neutralized it almost completely. Thanks so much for making my life much more enjoyable. The Pet Beverage Keeps Odors Away! We have two dogs and we use The Pet Beverage all the time. It does keep the odors down! Now We can Snuggle Without the Odor! Sometimes accidents are good! I was looking for information on algae in ponds and noticed the Pet Beverage on your site. Boomer my 6 yr old Lab/Retriever has had bad breath and body odor for years. The other problem is he hates water, so frequent bathes were a real hassle and you could not get near his mouth with a toothbrush. It would get really bad in hot weather and we live in Arizona so you can imagine. You could smell him when you walked in the house. The only solution the veterinarian has was put him under anesthesia to clean his teeth (which did not have a lot of tartar build up) and buy expensive dog food, but they could not guarantee it would solve the problem. I am a very skeptical person, but decided to take a chance on your product and I am thrilled that I did. Within two days, I noticed a big decrease in his mouth odor and after a week he did not smell at all. This is the first dog I have had with this problem and I did not want him to come near me. Now we can snuggle and he doesn’t feel like an outcast. I have a lab/greyhound mix that I love. The problem was that I couldn’t get rid of her terrible frito-like smell. I tried giving her baths (more than any dog should have). I tried other products without any relief. I was very skeptical to try this Dog Gone It product, mainly because of the cost, especially if it didn’t work. I’m so happy I tried it. It has helped reduce the odors by at least 70%. I’m very happy with the results of using Dog Gone It. 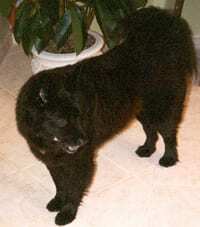 I wanted to express my continued belief that Dog Gone It helps control my black lab’s odor. His skin seems to stink when we run out! I have a 10 lb chi mix with rat terrier. She has always had a doggy odor even though I bathe her weekly. I googled how to rid of odors and The Pet Beverage popped up. I have been using this in her water for about 5 years. It’s great not to smell her doggy smell. If I run out of the product, I can really notice the difference. Thank you BioWorld for making this miracle beverage. Thelma & Louise – No more kitty litter box odor! Just a note to let you know how satisfied I am with your product “The Pet Beverage”. I have two cats, and as you know, the odor of a kitty litter box can be overwhelming. Adding “The Pet Beverage” to their water each day has completely eliminated the odor! House doesn’t smell like kitty litter! I just ordered a gallon of the Pet Beverage today–and it really works for us! We have two cats who use the same litter box–and by using the Pet Beverage in their drinking water, our house doesn’t smell like kitty litter!!!! In fact, it doesn’t smell like we have any cats in the house. We’ve been using it for two or three years now and recommend it to our friends. I saved your web site in my “Favorites” so I can access it when I want to re-order. I was frequently doing the arduous task of cleaning the kitty litter box. The Pet Beverage helped tremendously by removing all the odor involved in that chore. I am telling everyone I know about The Pet Beverage. My husband and I recently moved into our motor home with our four cats. One of our biggest concerns was litter box odor. We found out about your product (The Pet Beverage) and purchased some prior to our move. It’s amazing!! Visitors cannot believe that we live with four cats. There is no odor whatsoever. We are recommending it to all of our friends. Hi, Just thought I’d let you know The Pet Beverage worked. Princess Pyewcket is smelling much better now and so is Gryffin. Silver won’t touch it but she’s always been sassy, and she doesn’t smell as much anyway. Not only are they happier but I don’t have to drag their throws (blankets) up and down the stairs to wash them every day. I’m disabled so it means a lot to me. No more Cat odor thanks to BON!!! I am totally blown away by the BON (BioWorld Odor Neutralizer)!!! This stuff works on everything, and I have impressed a number of people with demonstrations of this stuff. One minute there is “cat odor”; a spray of BON, then the air smells like literally (and thankfully) nothing! I am totally sold on this amazing stuff! This is an awesome product! A Miracle Product for Stray Cats! As I have been rescuing stray cats for many years, there are a large number of former feral felines currently sharing my home. They didn’t come to me in the best of health since they were rescued from yards and streets, with far from the best nutrition in their formative years. 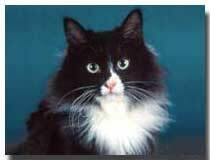 A couple of my cats are diabetic and one suffered an episode of acute pancreatitis a year and a half ago. The cats are enjoying a consistent supply of food now and have better diets than when they started out in life. Unfortunately, they don’t digest their food well and there have been awful smells coming from the litter area regularly. Nothing that I’ve tried has ever worked for very long. I originally ordered a liter of the Pet Beverage as a trial size, to see if it would do what it claimed: rid the house of those foul odors. I was so surprised that the house began smelling better. I noticed an improvement within a few days. Within a week, even the worst smelling cat showed an improvement. So I ordered another gallon. It works!!! I haven’t had any further problems. It seems like it’s a miracle. The gallon is nearly gone now and I have to order more. After several weeks of luxuriating in an odor free home, I think we’re hooked. Thank you for your terrific formulation. It will be much easier sharing my home with those stinky little friends of mine, since they aren’t stinking any more. I am so grateful. A friend recommended ‘Pet Beverage’ to me for my newly adopted cats.. whose poop was kind of smelly (and very noticeable in my small apartment. She has used it for over a decade with her cats with great success so I tried it. WOW!! a big difference in just a couple of days. We are now a CatBeverage household!! Doggone it.. that odor is gone. We are a company who breeds and sells ferrets as pets. After 10 days of using The Pet Beverage with a few of our ferrets, we noticed the ferret odors were eliminated. The feces odor was gone. The Pet Beverage does exactly what the product description says it will do – eliminate and control odors! I applied 1 ounce to my 2-gallon aquarium and left it to do its work. I hoped it would work, since I did not want my guests to smell the bad odor. That evening, I checked the aquarium and all of the odors were gone. I was amazed! The next day I checked the aquarium again. The tank was still odor-free and the water was crystal clear (not cloudy as it had been)! Thanks to the Pet Beverage, I’m happy, my guests were happy, and my dogs and fish are happy!